If you’re asking this question, you’re probably missing the point. GMOs are such a hot topic. With so many people debating pros and cons, it’s hard to know what to think. So let’s answer the question: Are GMOs bad for your health? Then let’s look at a few other important questions. Vitamin A deficiency leaves up to half a million kids blind each year. If I were to tell you that this is the most powerful statistic in the debate over GMOs, what would you think? Would you wonder how vitamin A could possibly relate to those little “Non-GMO Project Verified” labels you see on cereal boxes at Whole Foods? If so, here’s the story. Ingo Potrykus is a humanitarian and plant scientist in Switzerland who co-invented genetically modified rice. Yep, he makes GMOs, aka genetically modified organisms. Is he a villain then? Or at least a shill for some multinational corporation? Actually, his “golden rice” was engineered to fortify itself with vitamin A. By inserting a mere three genes into the plant’s DNA (out of around 50,000 total genes), Potrykus was able to create rice that carries the vitamin A in its grain instead of just in its inedible leaves. Up to 500,000 children lose their sight each year due to vitamin A deficiency, with half of them dying within 12 months of going blind. Golden rice would prevent this. Unfortunately, even though Potrykus finished his project about 15 years ago and made the seeds available for free to subsistence farmers around the world, malnourished children still can’t get golden rice. Because passionate opposition has blocked its development. So here we have a cheap, nutritious crop. Seven years of extensive scientific research. An invention that could completely eliminate an unnecessary epidemic. And that simple invention can’t reach the people who need it. I know, I know. “GMO” science can sometimes sound like comic-book stuff: crazy laboratories and mad geniuses, megalomanic super villains messing around with people’s food for their own entertainment and/or financial gain. Fish mated with cantaloupe! Rice with eyeballs! Wheat that makes you grow a tail! Frankenfoods! Island of Dr. Moreau! Etc. The whole issue has become synonymous with unchecked power, unethical tinkering, Monsanto, pesticides, contamination, and greed. I get it. Nobody loves giant evil conspiracies (except for super villains). But this is real life. There are no superheroes and super villains. The truth, as usual, is much more complex. And less diabolical. Of course, scientists haven’t been all that great at explaining this to the average person. (That’s what happens when you’re sequestered all day at a fluorescent-lit lab bench trying to splice DNA from fungi or whatever, along with writing grant proposals.) So, naturally, the average non-scientist imagines scary stuff. Allow me to speak for my people — the science geeks — and bridge the gap. If GMOs creep you out, you’re not alone. A growing team of anti-GMO activists — including hundreds of reputable advocacy groups, state legislators, and big-name chains like Chipotle, Whole Foods, and Trader Joe’s — are questioning the safety of GMOs. They say GM foods could cause major health problems like tumors, liver toxicity, allergic reactions, and death. So it’s no surprise that over half of the U.S. public said genetically modified foods are unsafe to eat in a recent survey from Pew Research Center. One-quarter of those surveyed said they check product labels for GMOs every single time they shop. GMOs sound scary and evil. But do people really even know what they are? Or how they work? A GMO, or genetically modified organism, is any living thing that’s been manipulated to evolve, whether via breeding, engineering, or mutagenics (something that purposely changes an organism’s genetic material). Most of the time, people debating GMOs aren’t really talking about GMOs. Instead, they’re talking about GEOs: genetically engineered organisms, things that have somehow been constructed by scientists in a lab. Genetically engineered (GE) plants, animals and microorganisms have had their DNA surgically altered for some specific purpose, such as increasing the vitamin A content of rice, making plants that need less water, or exploring genetic disorders. For instance, you’ve probably heard of Roundup Ready® Wheat. This is a strain of wheat that resists a weed-killing herbicide known as Roundup. Roundup is often sprayed on crop fields to kill off weeds. It works by attacking a plant enzyme called EPSP synthase. When EPSP synthase is attacked, weeds die. But so do other plants. While Roundup Ready Wheat still has the EPSP synthase enzyme, it has a different version, which is invulnerable to that attack. So the weeds die while the wheat survives. You can add “programming” to the existing DNA system to make something new. For example, to create Roundup Ready Wheat, they added a gene for EPSP synthase from a bacteria. Or you can stop the program of an existing portion of DNA. Interestingly, both knock-ins and knock-outs happen normally in nature. Oddly, they still carry talpid2, the gene that used to make the teeth, but over time the gene got knocked out by regular old evolution. Now it’s nonfunctional. Thankfully. When engineered, knock-outs are usually done for research. They help us figure out what a gene does. Did a GMO save your life today? As I mentioned earlier, the vast majority of GMOs aren’t crops like corn and soy, but rather mice, bacteria, and viruses used to investigate diseases and cures in labs all over the world. As a molecular biologist, I’ve made hundreds of GM bacteria, hundreds of GM yeasts and one GM mouse. They’ve helped me understand how muscle develops and fixes itself, and, from there, how we might develop treatments for muscular dystrophy. If you have type 1 diabetes, GM bacteria made your insulin cheap, safe, and accessible. If you’ve suffered from a genetic growth disorder such as Turner’s syndrome or short bowel syndrome, GM bacteria made the Human Growth Hormone injections that help regulate your growth. If you’re a hemophiliac, I’m sure you feel much safer with your treatment coming from GMO rather than from blood donations. Cells in a lab dish made recombinant human factor VIII. If you ever suffer a stroke or heart attack, you might be treated with medication made by tissue plasminogen activator, a cellular GMO. If you have multiple sclerosis, you’re perhaps thankful for interferon, also made by a cellular GMO. If you have cystic fibrosis, the enzyme you take, Dornase alfa, is made by a GMO. Undergoing chemotherapy for cancer? Two GMO drugs that help your bone marrow and blood counts are Erythropoietin (EPO — yes, that EPO) and granulocyte-colony stimulating factor (G-CSF or GCSF). Lactose intolerant and taken lactase? It comes from GMOs thanks to genes from either a fungus or a yeast. If (heaven forbid) you ever contract Ebola, you’ll be beyond grateful for ZMap, a collection of antibodies grown from GM tobacco infected by GM viruses. In the end, it’s kind of a shame that the debate over GM crops has led the general public to brand everything “genetically modified” as bad. 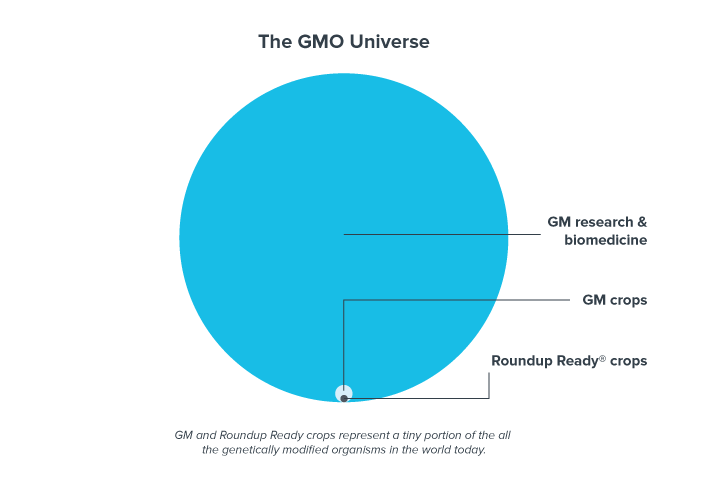 Because GM crops only represent a teeny, tiny percent of what’s happening in the GM universe, most of which is geared toward helping people and saving lives. Sometimes people say that GMOs aren’t natural. And, if they’re referring to genetic engineering, they’re correct. Most of the evolution we’ve known on this planet has been the result of naturally occurring, random gene recombinations and mutations. In fact, that’s how you and I came to be. Intentionally making a GMO on the other hand — again, that’s genetic engineering — is deliberate and strategic. And that may be a good thing. Farmers have been deliberately changing organisms by playing with DNA (whether they realized it or not) for millennia. More than 10,000 years ago, our ancestors domesticated hundreds of plants, inventing agriculture and cultivating crops that are still our main food sources today. Through artificial selection — selecting specific traits over generations of crop or livestock — plants like corn and wheat have been bred for flavor, texture, size, and tolerance to environmental conditions. Tomatoes, for example, used to be small and tart; if you want a bigger, sweeter tomato, then you only plant seeds from the biggest, sweetest tomatoes. In the 17th Century, Dutch farmers bred carrots that were orange instead of yellow or purple — a nod, some speculate, to the Netherlands’ orange flag. Today’s consumers typically want all of their produce to be bright with no blemishes, and seed-free. (Did you know that bananas used to have seeds?) The reason this is possible: Most produce has been bred (i.e. genetically modified through artificial selection) to be blemish and seed-free. Artificial selection has been used with domesticated animals too: In 1950, an average chicken would produce 125 eggs a year. Decades later, we’ve bred them to lay 250 eggs annually. Cows’ great-great-great-great (plus a bunch more “greats”) grandparents were aurochs. They were bigger and they were total jerks. After years and years and years of people picking the most agreeable aurochs, we ended up with creatures so docile you can tip them over (if you yourself are a jerk). Genetic modification isn’t some scary new science. We’ve been doing it for a long time. However, we’ve been doing it in a very rough, imprecise, “chainsaw” sort of way. Now, with genetic engineering, we’re able to do it in the best possible way — in a strategic, precise, “scalpel” sort of way. We also have a much better idea of what we’re changing and what impact it’ll have. It’s true that with genetic engineering you can use any gene from anything — you could even make up your own DNA — potentially creating combinations that would never otherwise exist. But this isn’t really an argument against GE. “Foreign” DNA inserts itself into other organisms in the wild all the time, likely yielding all manner of outcomes — positive, negative, and unknown. For example, around 8 percent of human DNA is actually from viruses, which have invaded our bodies throughout history. This viral DNA has helped placental development during pregnancy, and for making more enzymes to break down carbs. Some of these concerns have to do with the aforementioned fear of inserting “foreign” genes into the DNA of the crops. The truth is that GE foods really aren’t so different from conventionally bred plants and animals. Look at Figure 1. We have wild corn alongside conventional corn artificially selected for hundreds of years. Notice how different the corn has become through non-GMO strategies (i.e artificial selection or “the chainsaw method”). Figure 2 compares conventional corn and genetically modified corn. Can you guess which is which? And check out Figure 3. Is that bull on steroids, or what? (More on this to come). Bottom line: Genetic engineering is a much more exact method that leaves less to chance than conventional breeding or artificial selection. Modifies only a few genes (usually only one, in fact) leaving the rest untouched. Shuffles hundreds of genes at once, changing their position in the DNA. Allows strict control of each gene’s production — where (for example, in the seed but not the plant) and when (for example, during development but not once the plant is mature) genes are on. Breeders have no idea where and when these genes will end up and how they’ll be expressed. Genetically modified corn is exactly the same as domesticated corn, with the exception of one or two genes. In comparison, wild corn has many genes that differ (about 5 clusters of genes), each producing small variations in the plant. So, in most ways, conventional farming methods have had much more of an impact on our food than genetic engineering. Oh, and by the way, Figure 3 is a not a GM bull, but one made from breeding. Again, artificial selection not genetic engineering. With the precision of genetic engineering — what most people fear when talking about GMOs — this “accident” wouldn’t have likely happened. But with artificial selection — what most people seem okay with — you get this freaky cow. There’s nothing intrinsically unsafe about genetic technology. As I argue above, it’s probably even safer than most of the approaches being used today. However, there are some GMOs that could harm the world’s food supply. First, certain kinds of GM crops could be wiped out by weeds or pests. Humans and weeds are at war with each other. Crops go to the winner. As with many wars, this one has seen a military escalation, with more and better weapons. Humans use herbicides (chemicals that are toxic to weeds and living things in general). The weeds retaliate by evolving to resist the herbicides. Humans then use more of a different herbicide. And on and on the escalation goes. Problem is, the crops can only take so much herbicide exposure before they become collateral damage in the war. Solution! Enter genetic engineering and its herbicide-resistant crops (remember Roundup?). It doesn’t work that way. The massive use of herbicides wiped out nearly all of the weeds — but the few that survived are now hyper-evolved, breeding herbicide-resistant strains. Let’s use more herbicide! The war drags on. Eventually, the weeds become resistant to these herbicides, and there’s major loss in crops. Similarly, Bt-corn is programmed to make its own pesticide to wipe out the caterpillars that might munch on it. Good, right? But what if there are other, just as destructive pests just waiting for those weak and frail caterpillars to get out of the way so they can jump in to eat the leftovers? The second big threat GMOs pose to our food supply is genetic erosion. Genetic erosion happens when an already-small gene pool gets even smaller and more uniform. Getting GM food to market is a strictly regulated process that takes up to 12 years. One part of this process is ensuring that GM foods are 100 percent genetically uniform. Every single seed, every single ear of corn, has to have the exact same DNA. This homogeneity — this genetic erosion — may mean that we lose diversity, which could make our food supply less robust. With the same DNA, organisms have the same vulnerabilities. A plague, drought, fungus, or other pathogens could wipe out all our crops at once. Then we starve. Herbicide escalation and genetic erosion should be taken seriously, to be sure. But in order to consider solutions, it’s important to recognize that these problems aren’t specific to GMOs. We’re well aware of the unacceptably high pesticide levels found in many of the fruits and vegetables at the grocery store. Non-GMO crops can be the source of herbicide escalation, too (weeds simply become resistant through natural selection). Genetic erosion isn’t a new worry: 100,000 years of breeding practices have led to a certain amount of uniformity already (though it’s prudent to make sure GM crops with advantages over conventional ones don’t further narrow the genetic pool). No doubt that GM practices should be checked and strictly regulated. It’s a good thing that we have watchdog groups keeping the balance. Like everyone, scientists make mistakes and do the wrong thing sometimes! But we have to look at the big picture. Focusing on GM foods means missing 99 percent of the problem. So are GM foods safe? I know you want to know — and I sympathize. GM ingredients and additives are used in so many of the foods we eat. To begin with, there are 1500 published studies indicating that GM foods are safe. But I’m not going to rest a case on them. There are some animal studies that might raise red flags, but I won’t cite those, either. Because here’s reality: While most scientists believe GM foods are probably safe, science will never prove it 100 percent unequivocally. We need to get beyond that, to stop throwing studies at each other. Nothing can be proved to be absolutely unequivocally safe. Pick anything, and somebody has died from it. So let’s explore the grown-up questions and gray areas, and think about what trade-offs we’re willing to make, in a scientifically informed and literate way. What aspects of GM technology could be really good for the world? Why? Which aspects should we be cautious about? Why? What do we know to be true (or is probably true), and what is speculation? What’s the evidence? How much is our discomfort with the unfamiliar driving the fears? Are we correctly assessing risk and reward? What’s an acceptable level of risk to get the benefits? As a scientist, I would love people to embrace science, evidence, and the joy of discovery. Scientists grapple with some very difficult and complex questions. And most of them just want to make the world a better place. Short of going back to school for a Ph.D. in biology, what can you do right now? 1. Elevate your thinking game. Almost no scientific question is about good versus evil. Even spacetime bends occasionally. Recognize that issues are complex. If you’d like some practice with this, may we recommend our Level 1 and Level 2 Nutrition Certifications? 2. Be a critical consumer, learner, and listener. Contrary to what the mainstream media might lead you to believe, the biggest threats posed by GMO crops on the market today are not to your individual health, and they’re not even specific to GMOs. Picking a side — and assuming the other side is unreasonable — makes real communication impossible. Scientific findings presented as the “final word” are probably being misinterpreted; be wary of anyone who tells you something is “100 percent true” about GMOs. Even as sciencey folks ourselves, we’re not going to give you The Big Definitive Answer either. Because there isn’t one. 3. Address specific issues. Don’t mix them up. With GMOs and other food safety and regulatory issues, it’s important to think critically about our concerns. Are you against pesticides? Great! But that’s different from being against GMOs, and to focus on GMOs here is to ask the wrong questions. Want GM foods to be labeled as such? Great! But the importance of food labeling goes way beyond GMOs. Worried about large companies controlling our food? I get that. Be against Big Food, not GMOs. Both conventional farming and GMOs use herbicides and pesticides, narrow the genetics pool, and increase the risk of catastrophic loss of crops. Conflating these issues means change will never happen. 4. Focus on the big picture and real-life priorities. Other leading causes of death are largely due to the toxic combination of sedentary lifestyles, stress, and poor nutrition. Never mind GM vegetables — people aren’t eating vegetables, period. So start with the key behaviors that will really make a difference. (If you’re wondering what those are, check out our Nutrition Coaching Programs for menand women). 5. Keep things sane and sensible. The world, in general, can feel scary. Things we don’t understand can feel even more so. Control what you can control, as best you can. Make PN-friendly choices as consistently as possible, as well as possible.